These were scrumptiously yummy. 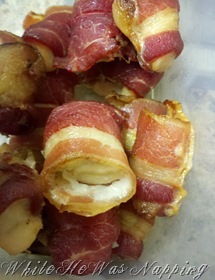 But, what do you expect when you take one of our very favorite recipes and then wrap it in bacon. Heaven to my taste buds. 1) Cut your chicken breasts into bite-sized pieces. But don’t make them too small. Think between a bite-size and a fun-size candy bar. 3) Prepare a baking sheet by lining it with tin foil. Preheat the oven to 375F. Open and unwrap the bacon. Cut the bacon strips in half. Drain the marinade off the chicken. 4) Lay down a strip of bacon, a piece of chicken and cut off a small chunk of cream cheese and place it on top of the chicken. Sprinkle with a little garlic powder or any other seasonings you’d like. Wrap the bacon around the chicken and cream cheese. Place on the baking sheet. 4) Repeat step 4 with all the piece of chicken and bacon. Bake for 35 mins or until the middle of the meat is no longer pink and the juices run clear. These look so good! I’m pinning this idea to use at our next dinner party! Thanks! These look delish. Chicken, bacon and cream cheese. It doesn’t get much better. Thanks for sharing. I would love it if you could link this up at our linky party going on right now. YUM – I’m going to save this site until I get more bacon! These sound so good! Hope to try them soon. Do you find that the cream cheese melts out too much? I have a similar recipe with full-size breasts wrapped in prosciutto and stuffed with herbed cheese. The cheese always oozes out. It makes a yummy sauce but I wish it would stay in there! oh my this is yummy and I’m salivating over it. We made this last night. They were a hit. Thanks for the recipe. I had these at a party a while ago and am so happy you posted this recipe! thanks! OOOh…those sound really good and fairly easy. reminds me of the jalapenos we stuff with cream cheese and wrap in bacon to grill. This would be so good with scalloped potatoes and some green beans – must add to my menu plan! These sound scrumptous! I am always looking for chicken recipes so adding this to my favorites to try. Thanks for sharing.